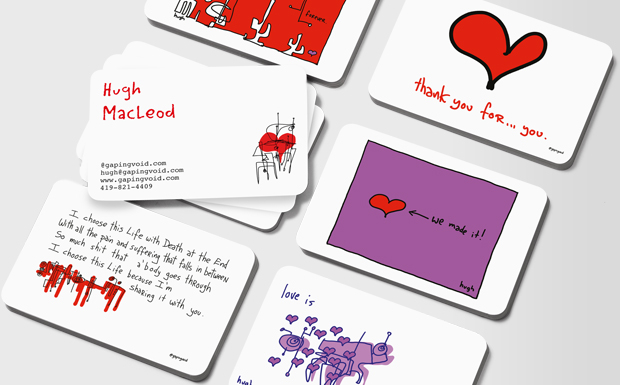 A couple of years later, after drawing a few thousand of them, I started letting others publish my cartoons on their own business cards, as well. I thought it would be fun, people handing out these little subversive drawing-ideas, as opposed the usual boring-corporate-formal etc. 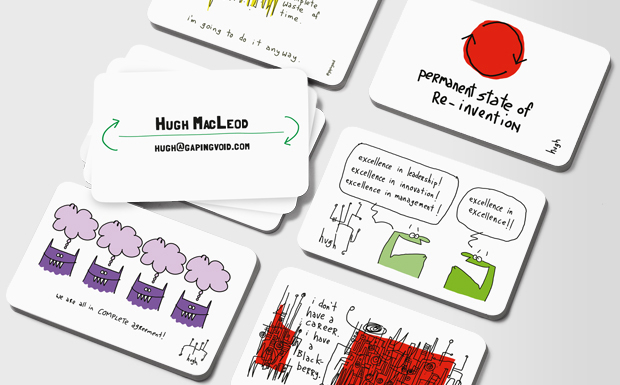 Just as the right cartoon on the wall of an office can spark “smarter conversations” around the water cooler, the right cartoon on your business card can change the conversation around you and your business. 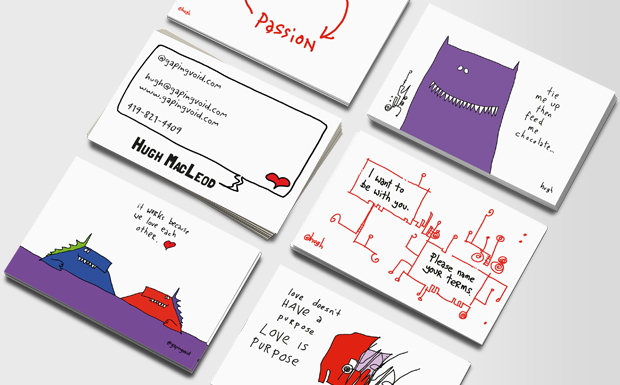 So it’s with great happiness and excitement, after years of talking about doing something with them one day, I am pleased to announce that gapingvoid is now publishing cartoon business cards with Moo.com, the coolest business-card publisher on the planet. 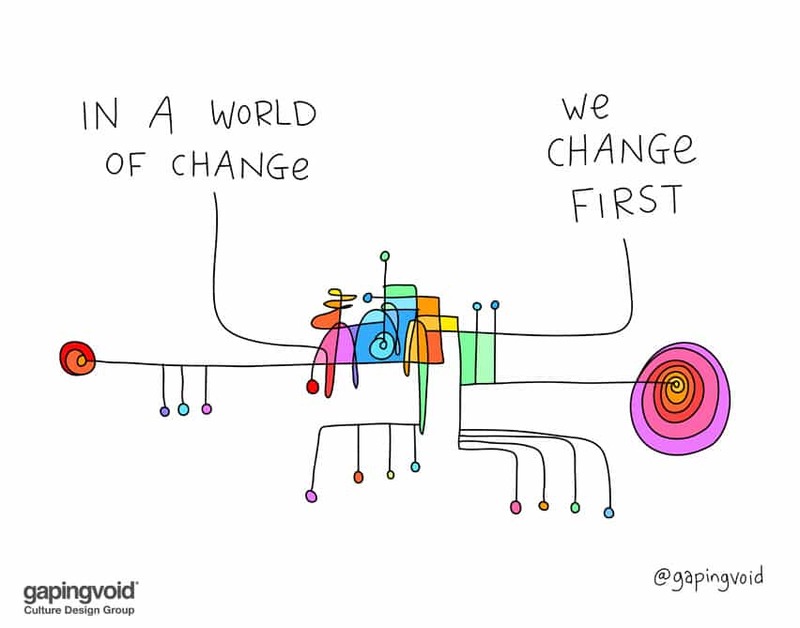 Actually, Moo’s Founder & CEO, Richard Moross and I go way back, when we used to go to the same seminal “Web 2.0” parties in London, back in the heady, early days of blogging. I always liked the fellow, frankly, and I always thought we should be working together. 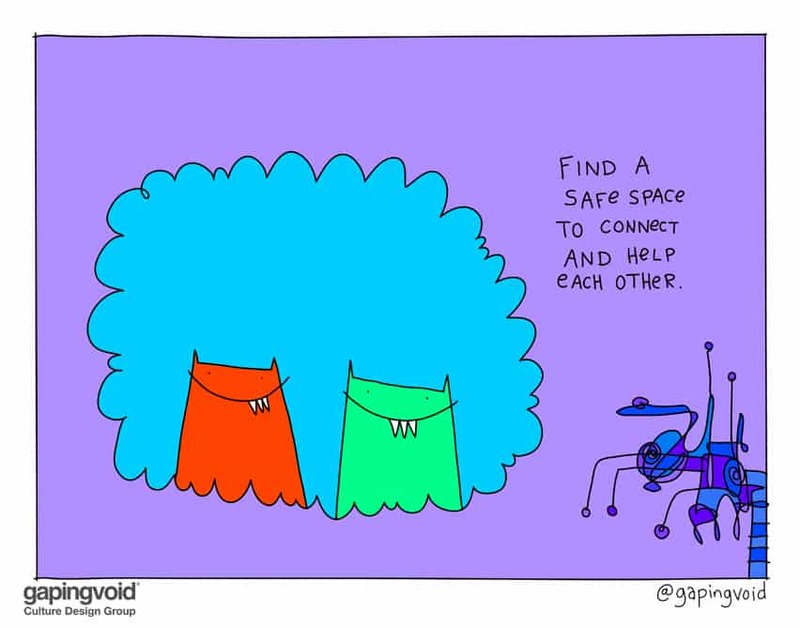 Moo has launched with 5 great packs of gapingvoid images, from Love, to Business, to Inspiration… in all, hundreds of cartoons to choose from. 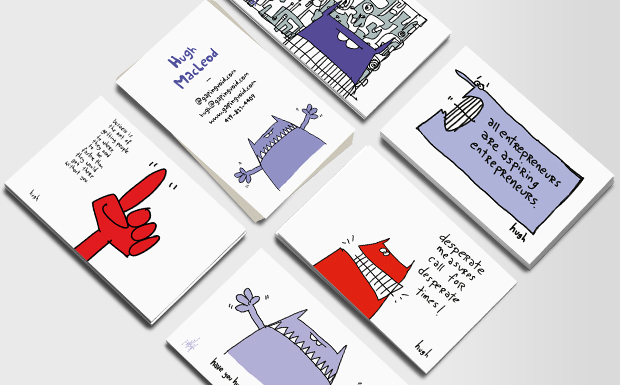 You can use just one cartoon as your design, or have a different image on every card (a cool bit of printing magic Moo offers with their packs). I hope you’ll go check them out, Thanks. 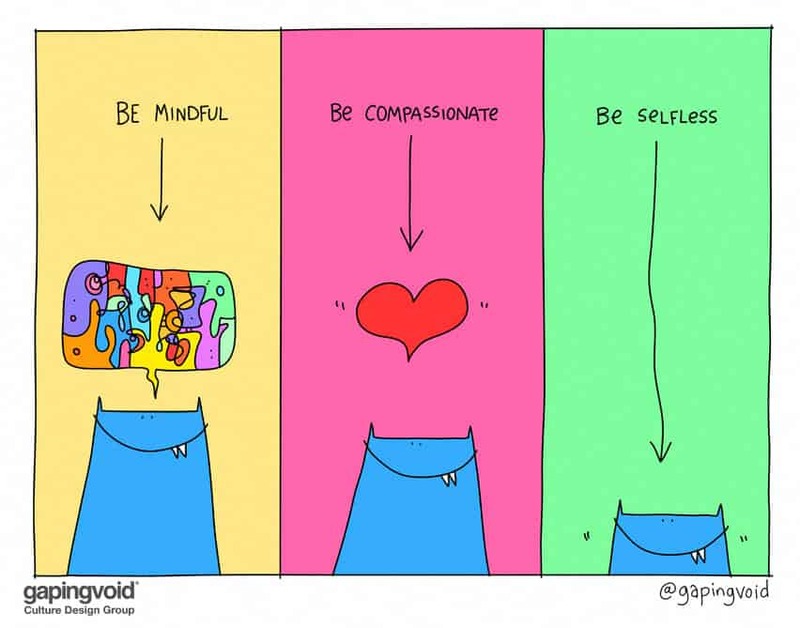 I love your blog and cartoons – they are very creative! I also like http://www.creativeleader.com as a good blog on creative ideas. 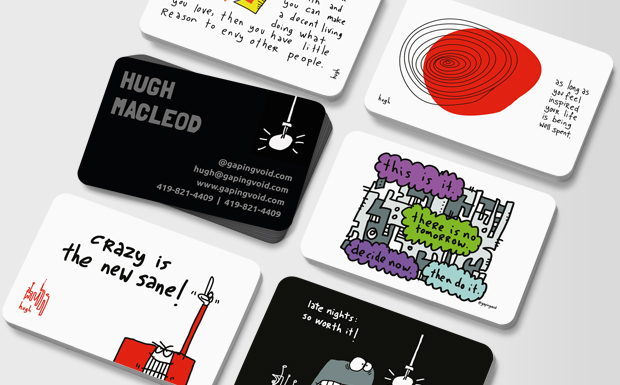 I love the artistic touch of cartoons in business cards. It simply means you don’t have to be serious all the time to be taken seriously.